What a marrige! We have combined two of our top selling products and the result is fantastic! 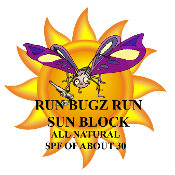 We have put the active ingrediants in our Run Bugz Run insect replent into our all natural sun block. Bam! A dual purpose product to doublely proctect your skin. No need to apply two different poducts, just the one.